The game was a 'friendly', meaning that it wouldn't count for anything. The Dallas club needed some practice, and the freshly selected newest members of the Scorpions needed practice as well. It was also discussed that the Scorpions would like to be one of the MLS expansion teams at some point, and this would be good experience. Larry, Zane, and I had already taken a trip to Dallas to see the Dallas team play Los Angeles a while back. Well, to see David Beckham, really. Zane wanted to show the soccer legend his new cleats, and we were all disappointed when Mr. Beckham bowed out. Something to do with those pesky Olympic games and the jet lag of overseas travel. Or something. But this would be different. This would be on our home turf, so to speak. It would be fun! And I decided to splurge a little and get as close to the green as possible. My goal(get it?--a soccer metaphor!) in splurging was simple. Life is about shared experiences. The best memories that I have happened with other people, most of them my family. I want my son to have those kind of experiences, too. My parents and my brother were also in attendance, so this was a family event of epic proportions. It is beyond exciting to be that close to the field of play in any sport, close enough to catch a ball if it flies into the crowd. Or to yell at the ref when he misses a perfectly obvious yellow card. Not that I would ever do that--that would be my brother. 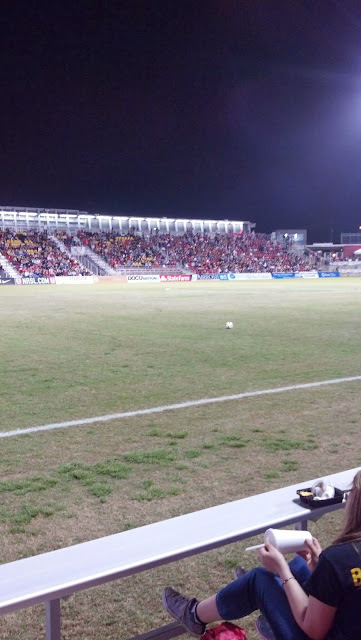 We were seated next to the section where the Scorpions Fan club was gathered, and the game was accompanied by the drums and chants of almost eight thousand people. The energy of the crowd was inspiring. When he is an adult, my son may recall an unseasonably warm March 1st when he went to a Scorpions soccer game, ate blue cotton candy and drank a blue snowcone, and pooped blue for a week(if you're a mom, you know how I know that). Maybe he'll also happily recall that the Scorpions tied a major league soccer team in the final seconds of the game, and that he was with the people who love him the most. If so, then it was worth it.